The Towering Pile: It is time! Let the reading begin! You guys! It's here! 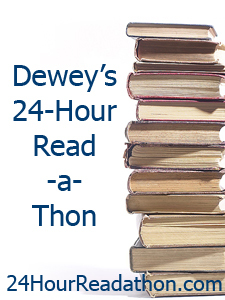 It's time for Dewey's 24 Hour Read-a-Thon! The timing is perfect for me. I just recently got out of a month long reading and blogging slump, and nothing gets me back in high gear like a good read-a-thon! I'll be sticking with my usual method of blogging updates every 2 hours, which I've found is the perfect frequency for me. I'll probably do a few challenges (at least the surveys), but mostly I find the most enjoyment from challenging myself to spend as much time as humanly possible reading, and to read as many pages/books as possible. Those add up to a total of 1260 pages, which is totally doable, if my past results are any indication, so let's call that my goal! Happy read-a-thon, one and all! Wow! I didn't knew it! Read-a-thon is fantastic! I would do it too!!! Can't wait to next one!! I just finished reading all of your post related to your challenge made avery two hours and that was great!! !